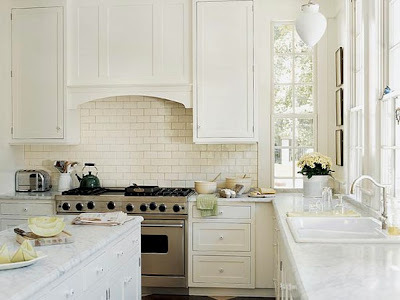 Alex and I are thinking about using white subway tile for our kitchen back splash. 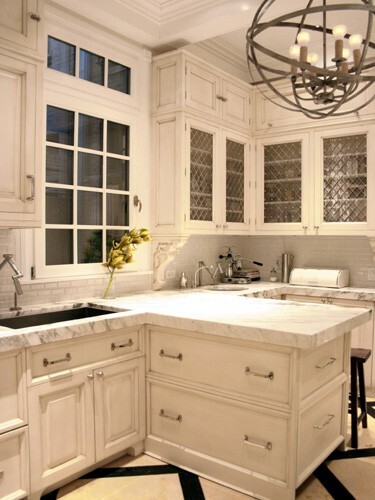 These kitchens are really inspiring me. Our counter tops are the same as the first and last image which is really helping me visualize it all. I am hoping to do this little project over the holiday weekend. What do you guys think about subway tile? I know it is really popular right now but, I think for good reason. I'm a huge fan of it too and would love to add it to our kitchen someday. The top photo is one of my faves! My vote is YES but I also think a splash of color would be great. @Alli/hooray....I am going to post pictures some dayyyyyy of my kitchen reno...it has become the never ending project! @Julia...we have lots of colorful artwork and a bright orange mixer! thats our pop of color! come and visit so you can see sister! 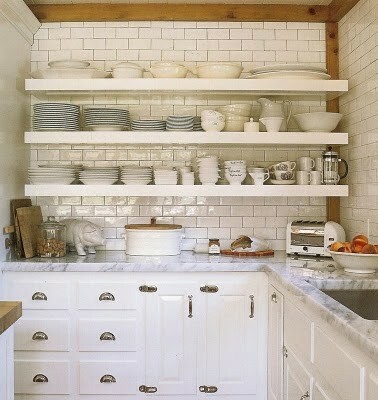 I really like the subway tile. We just bought in Richmond and the kitchen is in need of a major upgrade (red walls? black granite? no thanks). The last image is my favorite; I'm definitely going to revisit it for inspiration. Can't wait to see your reno pictures.